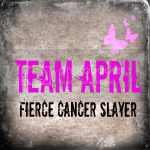 Two More for Team April: How I Love These Brave Women! My lovely sisters (in law) went short for me this week, donating their long hair to Locks of Love -- thank you, Whitney! Thank you, Bailey! It really helps having this team grow -- and spread across the country! And Bailey, in Oregon, cut 10 inches!